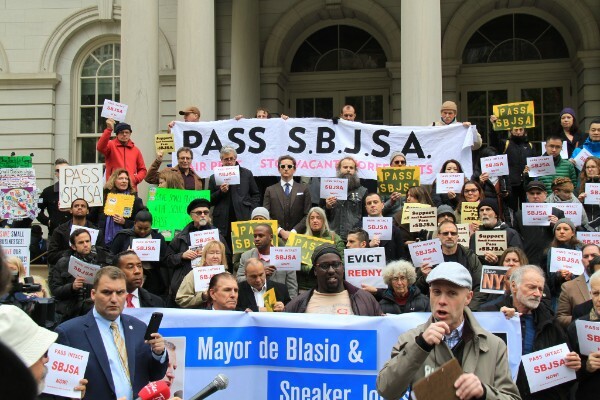 On Monday hundreds attended a rally and hearing in support of the Small Business Jobs Survival Act (SBJSA), a bill aimed at making it easier for small businesses to remain in their retail spaces and to end the epidemic of empty storefronts. 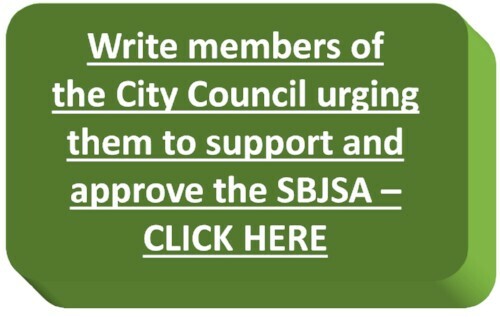 Friends of SBJSA, GVSHP and a citywide coalition of merchants and concerned New Yorkers led the effort in support of the bill, which got its first hearing in the City Council in years, in spite of broad support. Watch the video of GVSHP’s comments at the rally before here, and see pictures here. While Mayor de Blasio and the Real Estate Board of NY (REBNY) opposed the bill, there were hours of testimony in favor of the measure, which would require landlords to offer ten-year lease renewals to commercial tenants in good standing, and require arbitration if a price cannot be agreed upon. The measure would prevent landlords from simply not offering tenants lease renewals and asking astronomical prices which the market cannot support, as well as reduce warehousing of retail spaces. Speaker Johnson campaigned on a promise to hold a hearing on the bill, which he kept. At the hearing, he indicated a strong interest in enacting legislative measures that would address these issues, while acknowledging that the bill as currently written would likely require some adjustments. In the days leading up to the hearing and since, several additional Councilmembers have signed on as co-sponsors.